Since version 2.0 you need at least WordPress 4.9 running on your self-hosted WordPress installation AND PHP in a version greater than 7.0. If you don’t know how to update your PHP version, check this quick blog post for a start: How to update to the latest PHP version for WordPress. How can I activate the plugin? Please upload the plugin files to your /wp-content/plugins/ folder. Then head to the “Plugins” section in your WordPress administration panel. Click “Activate”. After that you will be asked to enter your purchase code. Click here if you don’t know where you can find your Envato purchase code. Click the blue “Activate” button. That’s it! After that you should find a new menu item called “Content after Posts”. What are the Actions and Filters I can use? If you want to allow/disallow the CAP content block for Gutenberg post types. It’s activated for all posts and pages by default. Has one parameter: (bool) $allow – default is true. Same as above but specific for a post type. Runs after backup init has run. After non-block-editor metaboxes are added. Runs when upgrades should be performed. How can I deactivate all CAPs (Content after Posts) on a single page or post? Can I use it within a network installation (network enabled, using it on all sub-blogs)? No. At the moment this is not possible. The plugin has to be activated on each plugin separately. But (as always) you can add a feature request. Can i use it to put feature images for my old posts? No. The reason for this is that WordPress’ content area does not allow dynamic content (like PHP). But maybe you can use this plugin: allow PHP in posts and pages. Does this plugin load anything in the frontend, that will slow down the site? Is the priority setting also for the ordering of these items? Yes. The priority allows to reorder the content (because other plugin can also add content to the top/end of a post/page/custom post type). How can I remove the “About”, “Social Media” and “Help” section when editing a CAP? Since Version 1.1.0. it’s possible to deactivate these sections through the language file. For example if you want to deactivate the “about” section open the language file /assets/langs/content-after-posts-en_US.po with your favorite language editor (like PoEdit). 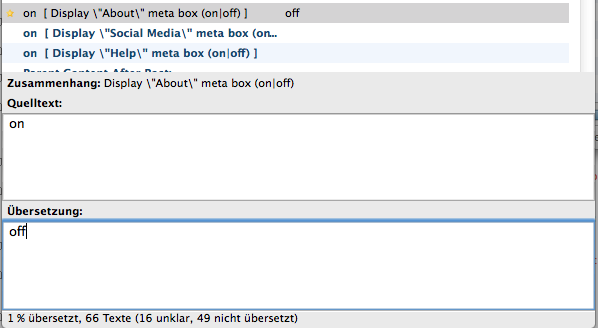 Search for the Entry “on [Display “About” meta box (on|off)]” and translate it to “off”. Save your file. That’s it. Don’t forget to do this with other language files, too. Don’t forget to upload the *.mo file via FTP to your webserver. Does it work with Visual Composer? Visual Composer is supported in versions lower 2.0. Since version 2.0 we only support the classic editor and the block editor (Gutenberg). Go to “Settings” -> “Visual Composer”. Just hit the “Save Changes” button. Does it work with the block editor (Gutenberg)? This is a required field. It defines where your new content should appear. After or before the main content of a page or if a text should be replaced. The plugin hooks into WordPress filters that allow to add a priority. For example, if you hook into the ‘the_content’ filter (see below) you may see that other plugins are using this filter as well. It could be that your CAP-text is not the last text on a post or a page. If this is the case, you can set a higher priority. A higher number means that the text is added later and therefore is below the text other plugins may add. This is a required field. As per default you should always hook into the ‘the_filter’ hook. This is the normal filter name for the content WordPress outputs on the frontend. Sometimes – and especially if you want to output text on special pages (like archives pages) – you need another filter because themes are sometimes using other filters instead of ‘the_content’. This should be obvious. Select a post type. Select a single post, page or custom post type. Just enter some text and the plugin will search in the background. Some themes have custom post templates. You can select them here. If you want to target specific post status. In the old days you could choose between several post formats. You can select them here. Select from a specific page type (like Frontpage, Blog page, etc.). Please note that some themes handle frontpages, blogpages differently. Just try to experiment with the settings to find what you need. You can also set it to “all” do activate the CAP on every single page. If you want to target subpages (choose a page parent here). Enter a specific date and time (ie. 2018-11-24 16:00). The plugin will match against the posts published date. Enter a specific date and time (ie. 2018-11-24 16:00). The plugin will match against the posts last modified date. Allows to enter a time interval. Please use the ISO 8601 duration specification for this field. It’s also possible to add time specific words in plain english like ‘8 days’ or ‘4 hours’. The plugin will match against the posts published date. The plugin will match against the posts last modified date. Allows to match against a current date and time. For example if a CAP should only be available from a specific date and time and/or between two dates. Use dates, like 2018-11-24 16:00 in this field.